MIAMI–(BUSINESS WIRE)–One Laptop per Child (OLPC), a nonprofit organization with a mission to provide every child in the world access to new channels of learning, sharing and self-expression, announced today that it has launched the project with the Government of the Republic of Gabon to initiate a 1:1 educational computing project for the children in the country. The initial phase of the project represents approximately ten percent of the children in Gabon and a total saturation of all primary school children is planned to be completed by 2014. The OLPC project was initiated by HE First Lady of Gabon, Madame Sylvia Bongo Ondimba. OLPC will provide full technological, educational and community development training to the Ministry of Education staff responsible for the project’s launch and will provide quarterly ongoing support in the country. The Gabon project will also include the involvement of the Office of the President in planning for countrywide deployment of the OLPC laptops. “Individual empowerment is the key to the future development of all of Africa and I am very proud that Gabon will demonstrate that educating children through OLPC is the foundation of empowerment,” said HE First Lady of Gabon, Madame Sylvia Bongo Ondimba. “We welcome the initiative and leadership of HE First Lady of Gabon, to launch the OLPC project in Gabon and look forward to her continuing support to reach national saturation for primary school children,” said Rodrigo Arboleda, CEO of OLPC Association. A hat tip to the franXOphonie community, including Kaçandre, Bastien, and OLPC France; thanks to them we have the Guide XO Gabon (from an OLPCorps project back in 2009-10) and a French version of the 2011 deployment guide. Christoph D just posted a lovely interview with Miguel Brechner about OLPC in Uruguay and Plan Ceibal. And a few months ago Karen Cator, Educational Technology Director at the US Department of Education, replied to a question from Miguel at a learning technology conference. She shares a few views from her Department, from Secterary Arne Duncan‘s interest in Uruguay’s leadership in empowering children, to issues of how long it takes to transition to such a program in our world of independent, federated states. Some states are saying that ‘by 2014 they want to be like Uruguay in terms of… laptop access‘. Uruguay tiene presencia mundial no solo por el fútbol. El Plan Ceibal hace que nuestro país tenga una presencia importante en grandes eventos. “Hace algunas semanas, fui a un congreso con veinte mil personas en Estados Unidos, y el primer día no dejaron de hablar de Uruguay”, explicó Miguel Brechner. Read the whole piece (in Spanish). One of the Millennium Development Goals of the United Nations is to offer a sound elementary education to all children of the world by the year 2015 and to increase their access to information and communication technologies. One Laptop Per Child has worked since 2006 on this urgent educational mission in collaboration with public and private organizations in some forty nations, mostly in developing countries. The great diversity of educational environments – or the lack of them – is the principal challenge here, and needs careful programming based on local conditions and human resources. OLPC is founded on five principles: ownership, early ages, saturation, connectivity and free and open source collaboration. This is the result of decades of research and development in advanced centers of study, and the XO laptop and the Sugar platform are two remarkable products of this international collaborative work. 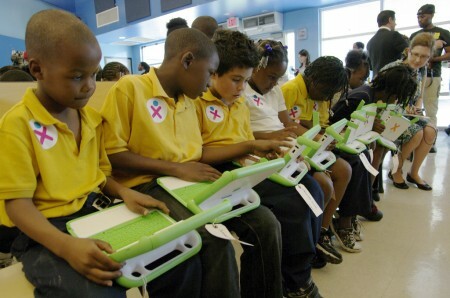 Other products will come soon as OLPC evolves to give answers to the increasing demands of education. The central question is how to scale up the OLPC program from a town to a province to a country, in order to satisfy the educational requirements of different student populations. The agenda is getting more complex with the expansion of the geographic area involved. The local authorities must establish a detailed agenda in several steps, to provide a sound educational program to different cohorts of students, continuous training of teachers, and distribution of laptops to all children and teachers. Also the implementation of servers and internet connectivity in schools and public places, the logistics of repair or substitution of the laptops, etc. This whole process is part of a dynamic “cultural evolution” that produces a great variety of results, some unpredictable and innovative. 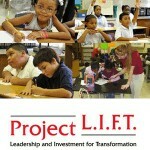 Knight’s contribution will fund a community engagement coordinator to keep parents and local communities in touch with the project as it develops, and for an OLPC program (including XOs and training) for all students and teachers in grades K-5 in the L.I.F.T. schools: roughly 3,200 in all. This builds on our work together earlier this year, to develop a digital literacy program at Holmes Elementary School in Miami. Our experience so far suggests that giving elementary students access to computers – and letting them take them home and use them with their families – helps promote better informed and engaged communities. We are delighted to see this new project take off within the framework of the existing L.I.F.T project. And looking forward to working more closely with the Knight Foundation, whose input has already informed some of our practices. Their background is in community engagement rather than education, which complements the viewpoints of our other partners. And the added focus on community engagement is one of those necessary elements that can make all the difference in longevity and impact.